What I am looking for is a custom filter that accommodates numerical ranges, something close to a price filter and I require three of them. If you know how to code them in, it should be possible. The child theme does not come with any filter built in. is there a way to implament a color fade say red to yellow left to right on the header? just wondering, can we set flatter to have ‘list-view’ layout in mobile also? 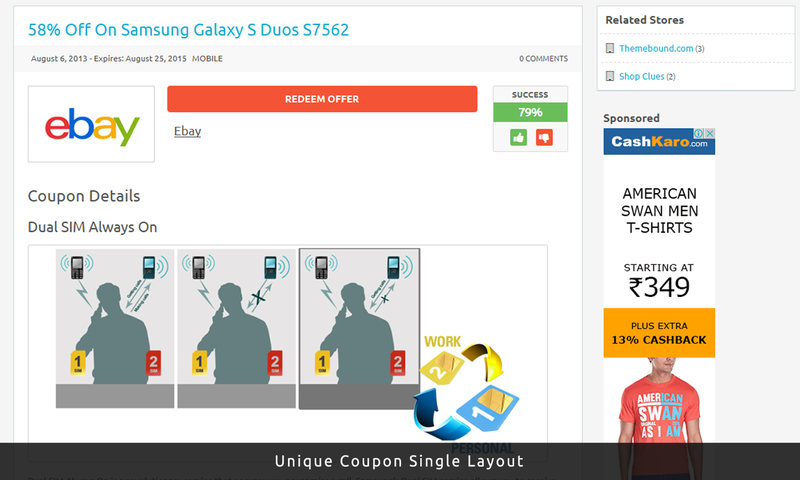 similar to RetailMeNot, it published the coupon in list-view layout for both desktop & mobile. 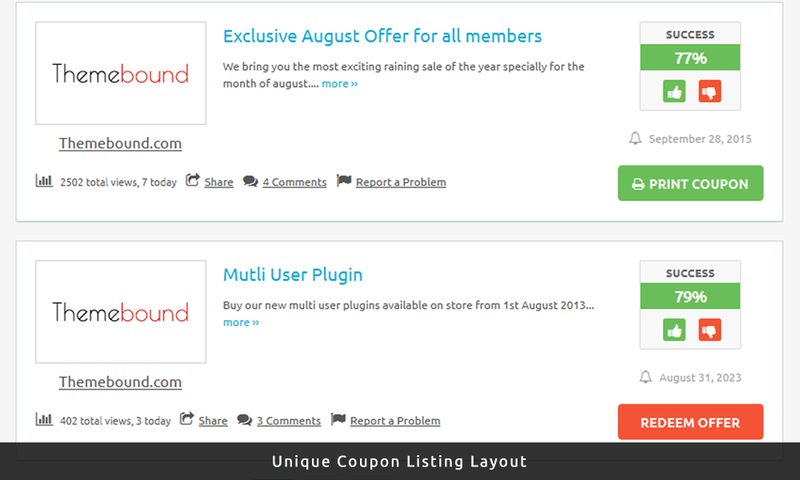 There is a separate plugin available for this on the marketplace called Coupon Thumbnails. 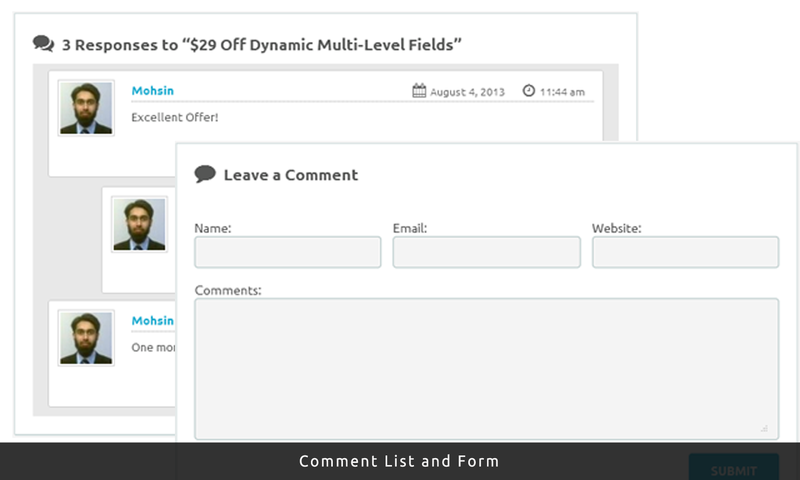 How To Give The Limit For Featured Coupons? You will need to edit the Clipper theme for this. 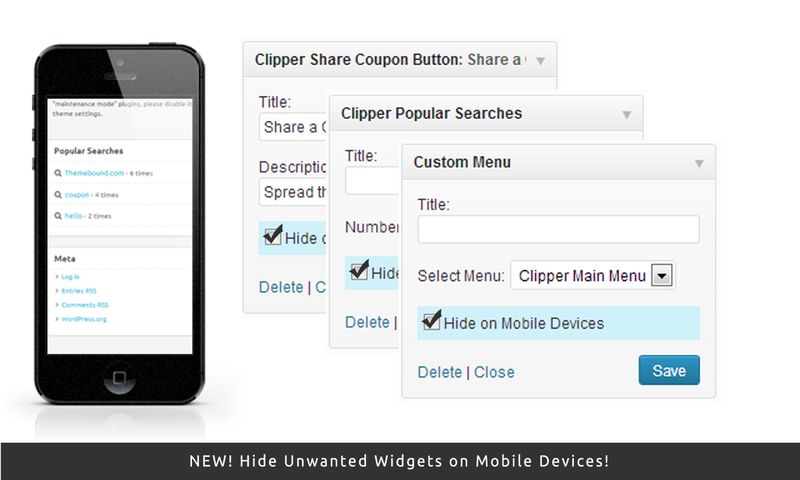 Please post in Clipper forums and one of the AppThemes support personnel would be able to help. 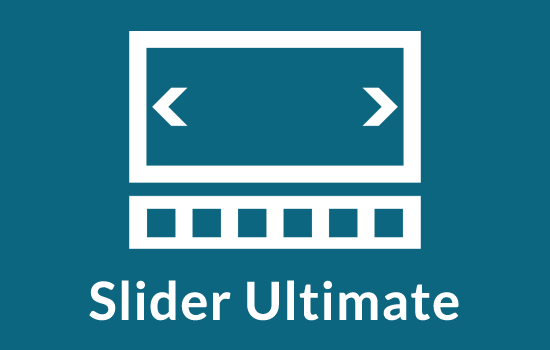 When you use the text sidebar widget a line is displayed at the bottom of the widget. The .widget_text and .textwidget show the border as none. I can’t find the css (using ‘inspect element’) to modify the code to remove this line (looks like a bottom border). How can I remove the bottom line? How to find the IP address of a user who spam voted “no” to a several coupons? for about 1 month, I can not write or change anything in clipper+flatter store descrition on stores. Is this because of wordpress updates or what ? how can I write or change the paragraphs or month names there ? İ cant change the month there. İ have updated the SEO months to September but cant update August on store description now. Please send any support requests via email please. 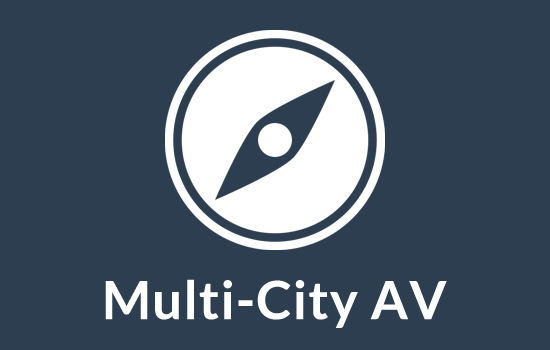 You can find our email address from under the support tab. The option “Force Open Affiliate Link” is useless under Microsoft Edge browser. Even when it’s combined with the plugin “CouponJoy”, it still don’t work as expected on MS Edge browser. I just hope future versions will make it work with Edge. It’s not that I use Edge, but I do have traffic from users using Edge browser. There’s no way you to get conversion if your visitors are using Edge as your affiliate link won’t open at all. Only the popup will activate, not the affiliate link on new tab, or on current tab. 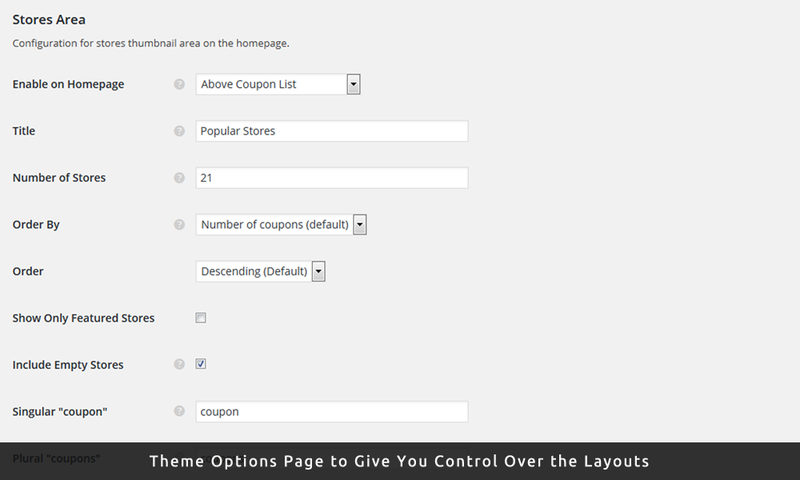 Previously I removed all default Home Page Tabbed Menu: (1) New Coupons, (2) Popular Coupons, (3) Feature Coupons. Now again I want to add these default Home Page Tabbed Menu, But in Menu Section I only find posts, pages, categories, and stores section. I can’t find this “Menus Section”, from where I can add these “New Coupons, Popular Coupons, and Featured Coupons in My “Home Page Tab Menu”. So, How can I add these default Tabbed Menu? Please send support requests via email. This section is purely meant for pre-sales queries. COUPON POP-UP WINDOW not operated. whate is the option for it. What file do I have to edit, and how do I do it? I sent you an email. Why isn’t Flatter 5.0.0 working with Clipper 2.0.0? Hai. i need flatter Version 4.1 . 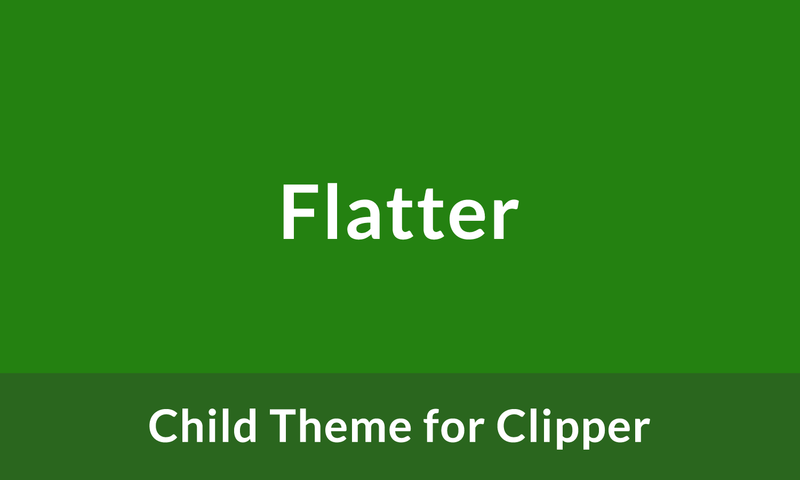 Because Flatter 5.0 is incompatible with my clipper theme. Can u please send the flatter theme version 4.1 to my mail. Hello Mosin! do you please help me! 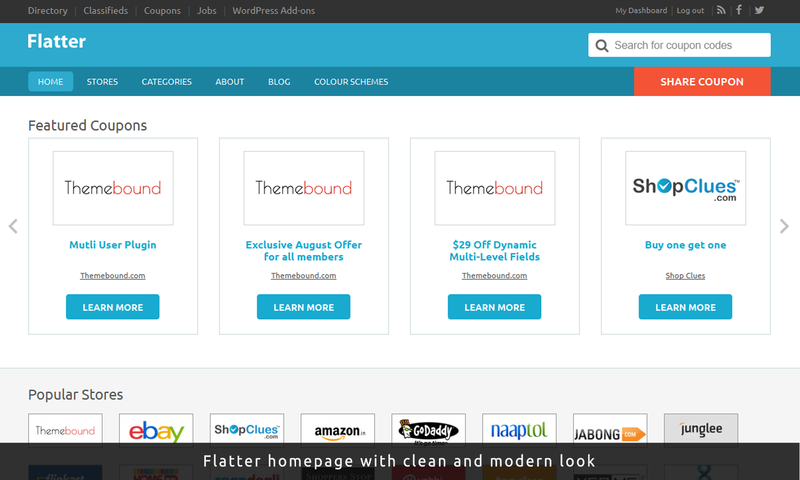 i want to move flatter child theme store sidebar left to right? i want to move flatter child theme store sidebar right to left? I emailed info@themebound.com few times, it’s been a week and no reply from the author. Alt values are empty for the images for homepage and when you do search and so on for Flatter theme. How do you populate Alt empty value with coupon page title? hi, do you have any plan for vantage 4.X? Flatter 5.0.3 is not working with Clipper 2.0.1? I have emailed you regarding this. Hello – Like Flatter and considering purchase. Is it compatible with Clipper 2.0? Is it possible to make responsive? I’m not satisfied with your marketing . You have just sold me your child theme without making it clear that I’ll have to buy parent theme before buying your child theme. Nobody will buy your child theme when we have already bought parent theme . 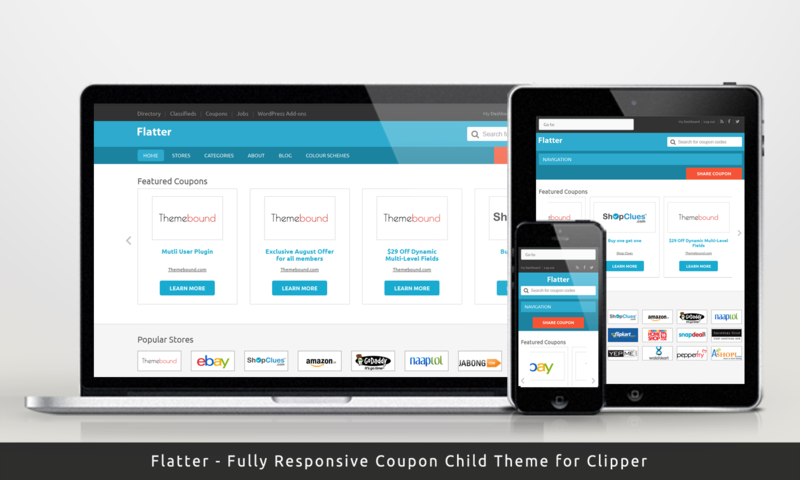 We would have our self made the child theme fro childify plugin. Can you people refund my money. Hello. Please tell me how to make 4 columns in the drop-down menu? 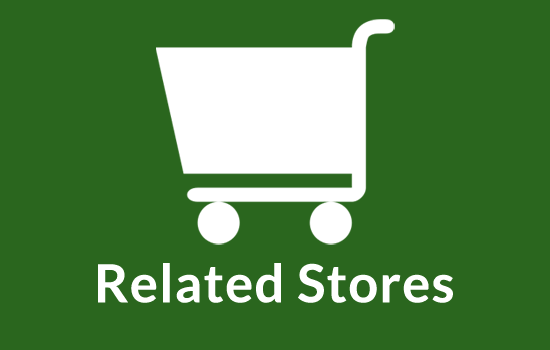 Hi I am would like to add related coupons from other stores on each store page. They should be below all valid coupons. Because all coupons for one store always have the same category I could teach by category. However I am stuck with the query_posts. Could somebody give me a tipp how to add category! Sorry for the delay to reply You.I dint get notified by all these comments for a reason or another. anyway, from now on, the comments will be visited daily and instantly. do you still want this feature?